Kirby Hickey (WMC Treasurer/CFO) cuts the chain at the European Desk opening at Methodist Church House, London. Photo courtesy of the Methodist Church in Britain. 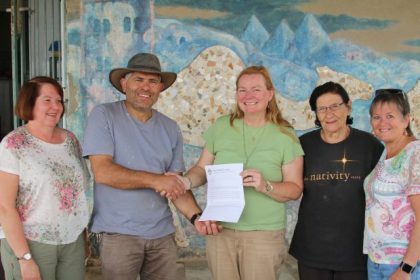 Bishop Ivan Abrahams, General Secretary of the World Methodist Council, will be taking up semi-permanent residence at Methodist Church House, London, following the official opening of a new desk for the World Methodist Council European Office. Present at the opening were Kirby Hickey, Treasurer/CFO of the WMC; Doug Swanney, Connexional Secretary; David Friswell, World Church Relations Team Leader; representative members of the WMC British Committee and members of the Connexional Team. Notably absent from the event was Bishop Ivan Abrahams himself, who was not able to attend due to illness. 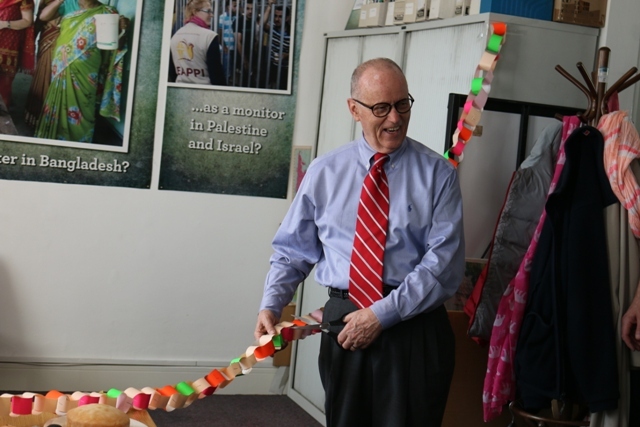 In Ivan Abraham’s place, Kirby Hickey officially unveiled the desk – cutting a paper chain reflecting the broken slave chains that are depicted around the sides of the Methodist Church House font. This font is carved from one of the stone steps of Nathaniel Gilbert’s house in Antigua. Gilbert, a slave owner, was probably the first person to share his Methodist faith outside the British Isles in 1760. Presentation of a £10,000 cheque to the WMC Achieving the Vision Endowment Fund. This was the second cheque given by MCB bringing the total amount donated to £78,000. Picture: Kibry Hickey, Revd Jenny Spouge, Revd John Barrett, Mr David Friswell, Mr Doug Swanney. Photo courtesy of the Methodist Church in Britain. 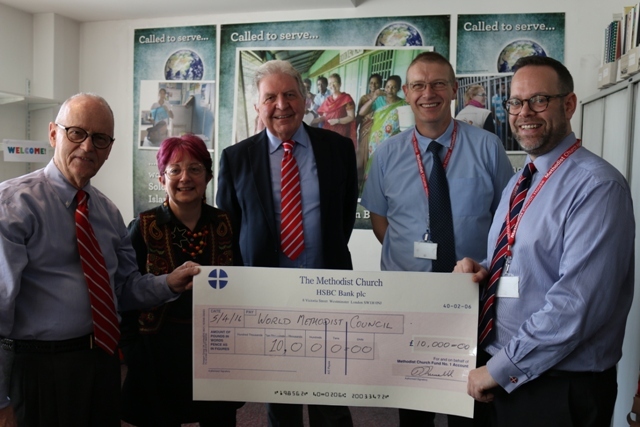 Following the chain cutting a cheque of £10,000 was presented to the WMC, bringing the total amount donated from the Methodist Church in Britain to £78,000. The event was closed in prayer by Doug Swanney who prayed blessing for the work of the WMC, for Ivan’s quick recovery and reminded those present that “under God’s care, we are all one together”.